The Kala U-BASS is truly a ground-breaking, short-scale, 21 bass. The U-Bass produces the same pitches as a standard bass instrument and is tuned in traditional bass tuning; E-A-D-G. Exotic Mahogany back and sides. Custom Kala and Road Toad logo inlays. Kala electronic system with active EQ and built in tuner. Includes a Deluxe U-Bass Embroidered Gig Bag. Meets most airline carry-on requirements. Set-up by Kala in the USA. The item "Kala UBASS-EM-FS Exotic Mahogany Fretted Ukulele Bass with Bag Active EQ Tuner" is in sale since Thursday, October 4, 2018. 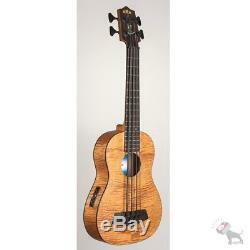 This item is in the category "Musical Instruments & Gear\String\Folk & World\Ukuleles".